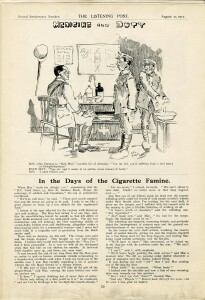 High casualties, poor food, and lack of sleep were among many factors that constantly threatened to undermine the morale, and therefore the fighting strength, of First World War armies. Desertion, when a soldier chose to abandon his military unit, was one possible indication of low morale, and often reflected excessive stress, mental break down, or “shellshock.” Some soldiers deserted directly from the front, while others simply chose not to return to their unit from leave. The army feared a trickle of deserters could turn into a war-losing tide, if left unchecked by exploring causes, preventing opportunities, and maintaining morale. To combat desertion, the army imposed the strictest punishments, including death by firing squad. Self-inflicted wounds (SIWs) were another way in which soldiers attempted to escape the trenches, inflicting enough damage on themselves to escape front line service with a long hospital stay back in England. An SIW could take the form of a gunshot wound to the hand or foot, or rubbing chemically infected soil in one’s eyes. 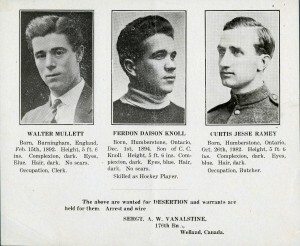 There were 729 recorded cases in the Canadian Expeditionary Force, and many more likely went undetected. Those under suspicion were typically sent to special SIW hospitals, subject to court-martial, and liable to sentences that ranged from a few days of field punishment to imprisonment. Similar to SIWs, malingering included pretending to be ill, shell-shocked, or deliberately injuring oneself. Other malingerers exaggerated or prolonged their nervous symptoms once they were already out of the line. Despite the strain on soldiers at the front, the number who tried to escape front-line service through these illegal actions was small. 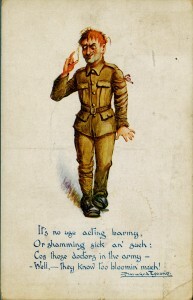 This satirical postcard shows a soldier feigning conditions of shellshock, and a poem on the army doctors who can see through the act. "Malingering" was a term to describe soldiers who pretended to be ill or who deliberately injured themselves in order to be excused from military service.